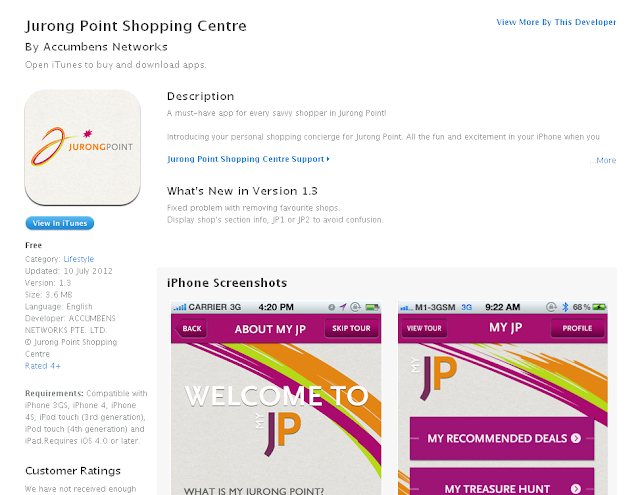 Developed by Digital Connect Pte Ltd, Jurong Point Shopping Centre iPhone App is your personal shopping concierge for Jurong Point on your iPhone. Besides giving you information on the latest deals and events at the shopping centre, the application has a mall directory which contains interactive maps of the mall with the ability to pinpoint the location of every retailer, eatery, restroom,ATM etc. Powered by Conveno Wayfinding API, the breakthrough application is able to show you the fastest route to get from any starting location to any destination location, including mobility routing. With Conveno Wayfinding API, creating interactive building directory becomes a breeze. Feel free to contact us to find out how you can start to create your very own interactive buildling directory! Jurong Point Shopping Centre iPhone App is available for download here at the Apple App Store. Hope you are glad for sharing this information. I really like your blog post very much. You have really shared a informative and interesting blog post with people. Thank you again for all the knowledge you distribute,Good post. I was very interested in the article, it's quite inspiring I should admit. I like visiting you site since I always come across interesting articles like this one.Great Job, I greatly appreciate that.Do Keep sharing! Regards, Click here to read more!